Root canal treatment (or endodontic treatment) is sometimes necessary if you have an infected or damaged tooth. The purpose of root canal treatment is to save the tooth and avoid its removal. 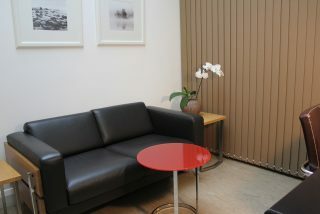 Surbiton Smile Centre are endodontic specialists, offering quality treatment and care from our clinic in Surrey. 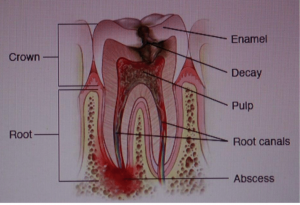 Endodontics is the study of the pulp of the tooth – endo meaning “inside”. It might also be called root canal therapy or root canal treatment. When the pulp of a tooth is infected, endodontic treatment is used to remove the pulp and clean the canals inside the root of the tooth. The root canal system is then filled to prevent reinfection and promote healing. Many people are wary of receiving root canal treatment, often because of a bad experience in the past. However, if you last had a root canal treatment many years ago, rest assured that it is no longer as painful as it once was. There might be some discomfort while you are healing, but the procedure itself is usually painless thanks to local anaesthetic, which keeps you awake but numbs feeling in a localised area. Any discomfort you might experience will definitely not be as bad as the pain of an infected tooth. Sometimes, a root canal procedure may be required as soon as possible. An infected tooth can cause a lot of pain, affecting the nerves in the tooth. In this case, the dentist can perform an emergency procedure to quickly provide anaesthesia and start administering treatment. In some cases, the patient might be in too much pain for the local anaesthetic to work. When this happens, the dentist can discuss alternative options for treatment. To understand how a root canal treatment works, let’s first take a look at the anatomy of a tooth. 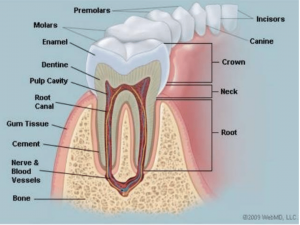 There are several layers to a tooth, with the pulp at the centre. Pulp: the soft tissue at the centre of the tooth. 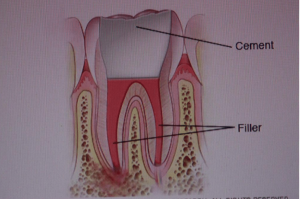 The pulp fills the root canal system and extends from the crown of the tooth, which is the visible part, to the tip of the root and contains blood vessels, nerves, and connective tissue. The pulp can become infected due to bacteria and decaying material, which can occur due to a cavity, a cracked tooth or perhaps a leaky filling. As well as the risk of an infection, tooth abscesses can also occur if the tooth isn’t treated. 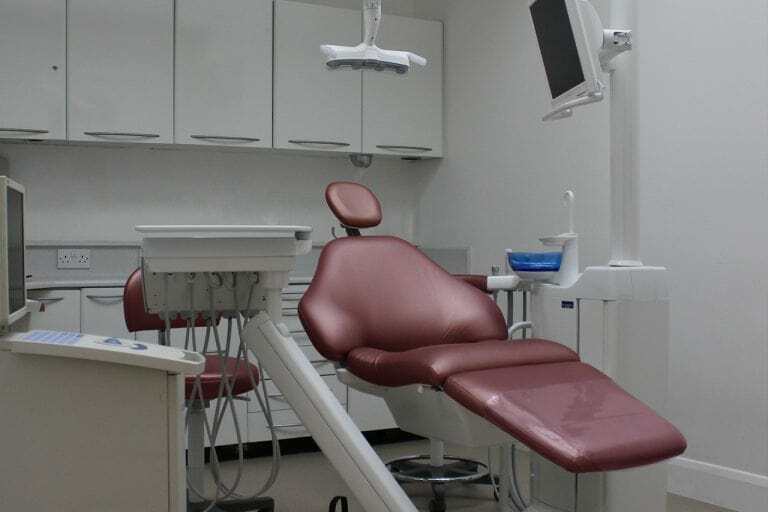 To treat an infection, the dentist will either remove the remove the bacteria and fill and seal the root canal or remove the diseased pulp and nerves inside the tooth. Root canal treatment usually requires a couple of visits to the dentist, but it might be more for some people. The dentist will take X-rays to take a look at the damage so that they can create a treatment plan. A local anaesthetic numbs the area, and a rubber sheet (called a dam) is placed around the tooth to keep it clean and dry. After removing the tooth decay, the dentist makes an opening in the crown so that they can remove the infected pulp. 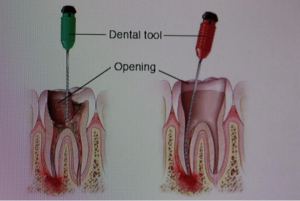 They then use root canal files to reshape the canals. The canals are flushed and cleaned several times during the procedure to ensure all bacteria is removed. Sometimes this might require several visits. 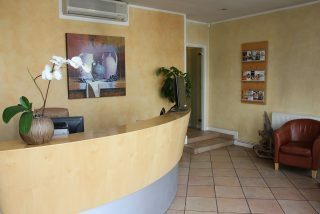 If a number of appointments are required, a dressing and temporary filling will preserve the teeth in between visits. Some patients might be prescribed antibiotics if they have a fever or swelling. A few factors can affect how long root canal treatment takes, including which tooth needs the treatment, as molars have more canals. Once the canals are clean, they are filled with a paste and rubber material. A filling restores the tooth and is carried out at the same time. Your dentist might recommend that you come back within the next few months to have a crown fitted, which will help to protect the tooth. The tooth is first made smaller so that the crown can be fitted on top. If the tooth isn’t strong enough to support a crown, a small metal pole is inserted to support the crown instead. Knowing when you might need a root canal is important. You don’t want to leave it too long, or it could lead to extreme pain, a tooth abscess, and other problems. If you experience these symptoms, an appointment with a dentist can diagnose the problem. Just like other medical fields, dentistry is advancing all the time. One of the best developments in endodontics is the use of microscopic root canal treatment. A microscope provides excellent magnification, which makes it possible to see much more. Being able to see and administer treatment at a microscopic level makes treatment more effective and accurate. It helps to minimise pain, and it can produce better long-term results too. It is also used for root canal retreatment, which is sometimes needed if symptoms persist after root canal treatment. After root canal treatment, some people might choose to have bleaching to lighten the tooth. This is because the use of tetracycline, an antibiotic used during treatment, or the damaged pulp might have stained the tooth. Bleaching therapy can correct this for anyone who is concerned about the appearance of their teeth. Cost is often a concern for people who need root canal treatment, especially when it’s an emergency. At Surbiton Smile Centre, we’re upfront about our costs and provide a detailed list of what you can expect to pay for different treatments. We carry out root canal treatment under a microscope, and the cost depends on which tooth requires treatment, as well as other factors. 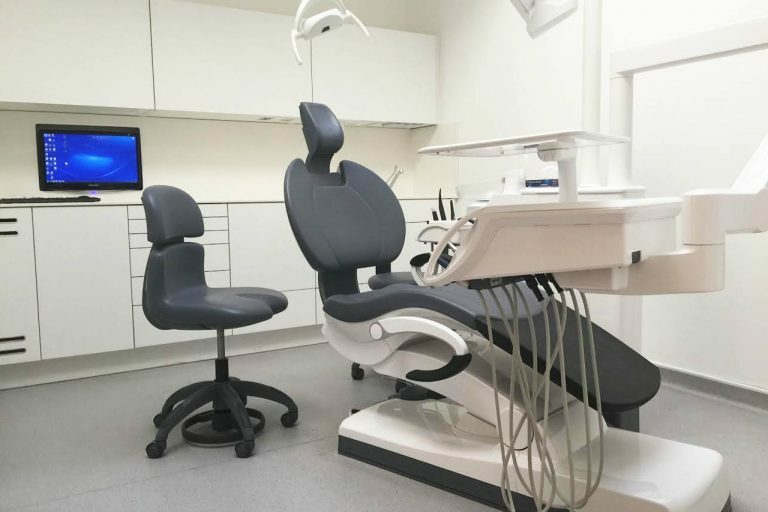 The microscopic root canal cost at Surbiton Smile Centre starts at £450 for an incisor, from £550 for a premolar and from £750 for a molar. You might also want to have a root filled front tooth bleached for cosmetic reasons, which costs £175 per session. The number of visits required for successful root canal treatment can vary. Sometimes the treatment can be completed in just one visit, but it’s more usual for it to require two or even three appointments to complete the different stages. Is root canal treatment always successful? Most of the time, root canal treatment is carried out successfully. However, sometimes it might not be the best treatment option. When this happens, removing the tooth and replacing it with an artificial alternative is usually the best option. The possibility of root canal treatment will be examined first to see whether it’s the preferred treatment. What can the crown be made from? After having a root canal, your dentist will usually recommend a crown. These can be made from several different materials, including gold, metal fused porcelain or zirconia, which is a metal-free option. What follow up treatment is there? When you have had your root canal treatment, it’s important to pay attention to your tooth. Some discomfort after the treatment is normal, and you can take a painkiller to help lessen it. However, it’s important to pay attention to how your tooth feels. If you have pain or pressure that lasts for more than a few days, you should go back to your dentist. Before having a crown fitted, be sure to take care and avoid putting too much stress on your tooth. You can avoid chewing on that side and choose softer foods to reduce the risk of causing any damage. Make sure that you brush your teeth gently around the treated area when you have a temporary filling. A crown is usually required, so be sure to book a follow-up appointment to get one fitted. In some cases, root canal retreatment might be necessary. If the treatment doesn’t work for you, the first time or reinfection occurs, retreatment is designed to deal with this. Remember that you should see your dentist at least once a year, if not every six months, for a checkup. As well as ensuring the tooth that received root canal treatment is healthy, they can also check the general health of your teeth.